Diet and exercise for the aging takes on special considerations. Exercise becomes less about losing weight to look good or to get first place in your respective sport, but more about maintaining health. Aspects of fitness like cardiovascular health, maintaining strength, balance and flexibility take on a more important role. Staving off disease and maintaining activities of daily living are at the forefront of exercise as you age. Don't discount nutrition, however. It plays a factor in preventing disease and aging healthily. An aging person should exercise at a moderate intensity for at least 30 minutes three days per week, according to the American College of Sports Medicine (ACSM). The intensity should be monitored as a rating of perceived intensity and not with heart rate due to the frequency of medications that may change your heart rate response. The duration may be split into three 10-minute intervals, if needed. The mode of exercise should be one that does not cause orthopedic stress. Walking, swimming and bicycling are all low-stress activities. "The Journal on Active Aging" believes that these guidelines are not specific enough. Judy Kruger, Ph.D., breaks exercise down even further in her report in 2010. Kruger states that individuals should be categorized as inactive, low, medium or high physical activity and be prescribed exercise accordingly. Resistance exercise can help combat sarcopenia, the deterioration of muscle that comes with age. For weight lifting, eight to 10 exercises that work all the major muscle groups should be selected. Start with a weight that feels moderately difficult and perform one set of eight to 10 repetitions to start, states the ACSM. Increase repetitions and sets before increasing weight. Exercises that work the large, major muscle groups include the lat pull-down, leg extension and flexion, chest press, upright row, triceps pull-down and biceps curl. According to Kruger, balance should play a large role in your exercise program. A reduction in falls is associated with 90 minutes of balance training per week. As you age, falling and balance become worrisome. Doing some simple exercises can help maintain your current balance. 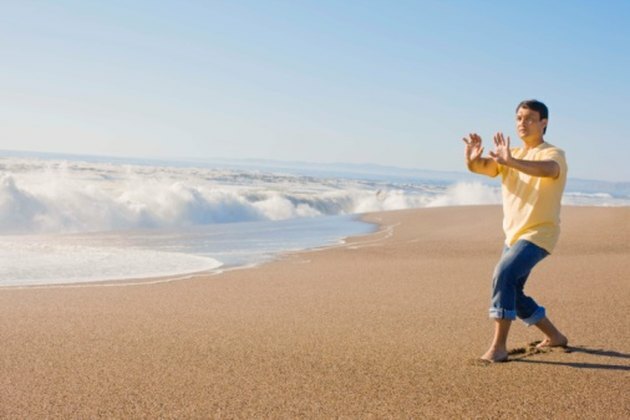 Balance exercise can include backward walking, tandem walking, toe walking, single leg stands and tai chi. Maintaining flexibility and full range of motion in joints and muscles can help maintain your musculoskeletal function, balance and agility. As you get older, activities like bending over become increasingly difficult. If you work on flexibility maintenance, these activities can continue to be done with ease. Make stretching a routine part of your exercise program. Flexibility training can be done after the aerobic, resistive and balance portions of your exercise session. Be sure to stretch all the major muscle groups and hold each stretch for at least 20 seconds. As you age, you must consider the nutritional needs of your changing body. If your body composition is changing, your energy requirements will become lower. Similarly, certain foods might antagonize certain conditions you have, like hypertension, high cholesterol or arthritis. According to "Nutrition" by Frances Sizer and Eleanor Whitney, older adults should eat a calorie-controlled diet high in fruits, vegetables and whole grains. Fiber, vitamin and mineral intake should be increased, while carbohydrate and protein intake should stay relatively the same. How Many Calories Per Day for the Elderly?